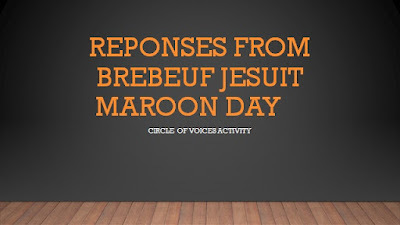 On December 7, 2016, Brebeuf Jesuit early admits were invited to a special school day we called Maroon Day 2016. 41 students spent the day with us - visiting classrooms, meeting with upperclassmen and enjoy special activities. I only had a quick 15 minutes with the students, but I was impressed with their enthusiasm and interest in their education. The plan was to do a Circle of Voices activity. Circle of Voices is a brainstorming technique where participants share experiences, thoughts or feelings on a topic. The trick is, each participate has 2 minutes to talk with no interruptions. After all have shared - only then can follow-up questions or further stories be told. The activity is built to encourage all voices in dialogue. 1. Give 3 adjectives that describe "a good teacher"
The answers and lesson plans are in the slide show below. We will be using this information in our continued discussions on freshman transitions, meeting needs of all our students and what teaching looks like in the 21st century. 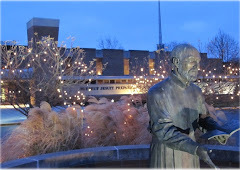 I hope you find these responses as profound as I did.... comments welcome!